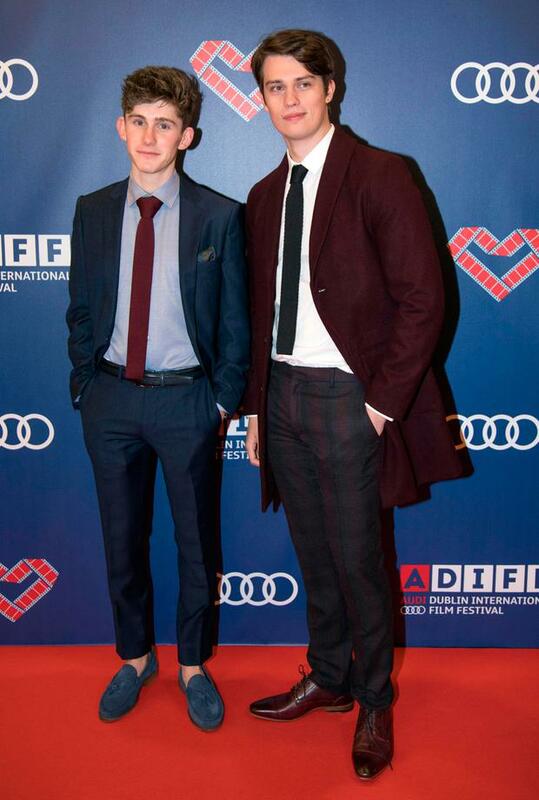 Fionn O'Shea was just three months into a business degree when he landed roles in Netflix hit The Siege of Jadotville and critically acclaimed Irish film Handsome Devil, opposite Andrew Scott, prompting him to ditch university to focus on acting full time. Although the Dubliner had been acting since the age of 11 - his first role was in the short film New Boy which was nominated for an Oscar - he felt a back up plan was a wise move. "My biggest fear was to finish that degree because my whole thing was, 'I’m going into this degree and something will come up’ but if something hadn’t come up I would be left going, ‘What now?’." "Even after I left after three months I deferred for a year thinking maybe I would be able to balance it. That was always the plan – to balance it – but then I just kept missing exams and missing exams and I thought, ‘God, I’m going to be a 50 year old man sitting my frist year business and management exams!’"
Thankfully he need no longer trouble himself over exams as his breakthrough in Jadotville, opposite Jamie Dornan, led to Handsome Devil, which in turn led to upcoming WWII film, The Aftermath. Directed by James Kent it stars Jason Clarke and Keira Knightley as a British colonel and his wife who are assigned to live in Hamburg during the post-war reconstruction where they encounter tensions with the preivous owner of the house, played by Alexander Skarsgard. “One thing that was so nice about it was like even though the scale of it was bigger than stuff I’ve done before it was really such a close knit atmosphere on set, a really friendly atmosphere on set, and that comes from the top down - Jason and James and Keira," says Fionn of the experience. "I learned so much from all of them. I am still pinching myself!" The Aftermath is slated for release later this year. In the meantime, Fionn will beaming into the living rooms of many Irish homes this week in his latest role in Innocent, TV3's new four-part crime drama which airs tonight, Tuesday, Wednesday and Thursday. Billed as 'a story of love, lust, jealousy and betrayal' it follows David Collins, a man who has spent seven years in a high security prison having been convicted of his wife's murder. However, when his conviction is overturned on a technicality he returns home to try to repair his relationships with his family and friends and finally mourn his wife, Tara. Fionn plays Jack Collins, David's son; "He’s grown up his whole life thinking his dad committed this horrible murder of his mum. He’s been living with his aunt and uncle and has done for half of his life but when his dad gets out of prison he wants to reconnect with him and have some sort of relationship, even though he’s grown up thinking his dad was guilty." The series was shot predominantly in and around Howth in Dublin. "Because I have kind of grown up in the industry – I started acting when I was 11 – it’s really nice to work in Ireland because I know a lot of the crew. I’ve worked with a lot of them over the years," says Fionn. "Also a big benefit – not to sound cheesy – is that we really do live in such a beautiful country and I definitely take it for granted so filming here gives you a chance to explore the place properly." Last year the young star was named one of four Irish actors on Screen International's 'Stars of Tomorrow' list which has previously predicted big things for Emily Blunt, Benedict Cumberbatch and Andrea Riseborough. He very much has his head on his shoulders, however. “I think you just have to try to take everything one step at a time. Nothing is ever a certainty. I feel really lucky to have been given these opportunities," he says, adding that he is mindful of the possible pitfalls of life as an actor. "I think maybe what is comforting is that a lot of actors that I look up to admire all go through that same thing of dry patches, some by choice, some not by choice," he says. "Of course it’s a worry but I suppose it’s one of those things where you just have to trust that the right thing won’t pass you. Sometimes it’s hard when you get very close to something and it doesn’t go your way but you have to trust the process." One of the actors he particularly admires is Handsome Devil co-star and Sherlock star Andrew Scott. "He didn’t sit me down and say, ‘Don’t be a dickhead!’ but I learned so much from him," he says. "He’s one of those actors I had looked up to, and still continue to look up to. I’m lucky enough to call him a friend now. I learned a lot from him. He’s so generous and kind of a dream person to work with." While he's not yet being accosted on the street, it looks likely that may be on the cards for Fionn at some point in the not too distant future. He laughs, “I don’t think people care. Maybe they recognise me sometimes, but I don’t think they care when they do! Funnily enough I get recognised more in the UK than here and it’s usually in odd places like when I’m getting a haircut or something!" Innocent airs on TV3 on Monday 14th May at 9pm, Tuesday 15th May at 9pm, Wednesday 16th May at 10:30pm and will conclude on Thurs 17th May at 9pm.